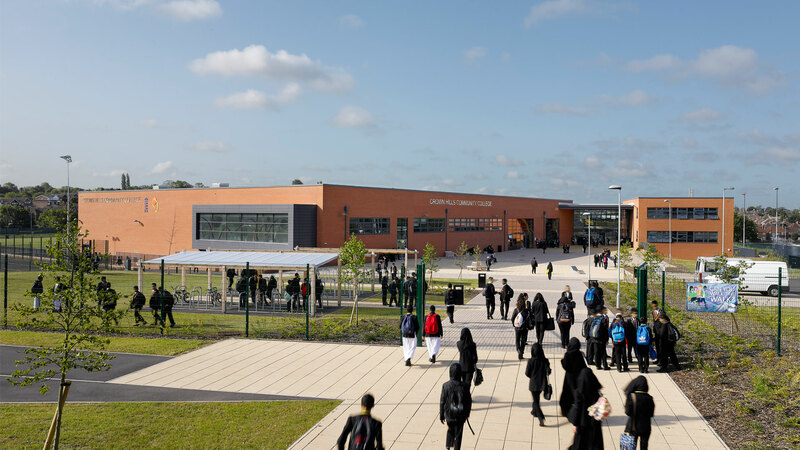 CROWN HILLS COMMUNITY COLLEGE IS A 1,200 PLACE SECONDARY SCHOOL WITHIN THE SECOND PHASE OF LEICESTER'S BSF PROGRAMME OF SCHOOL REBUILDING AND REFURBISHMENT. 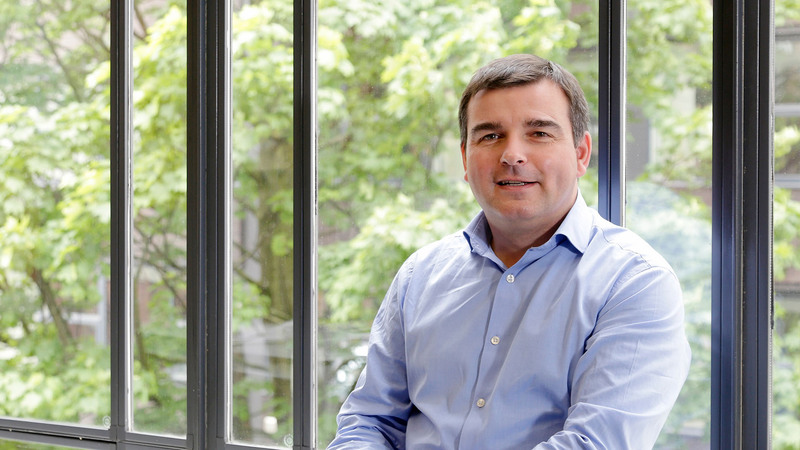 By securing additional funding and designing an efficient building this scheme has managed to take a part remodel/part new build budget and deliver a 100% new school building with an area of 11,700 m2. 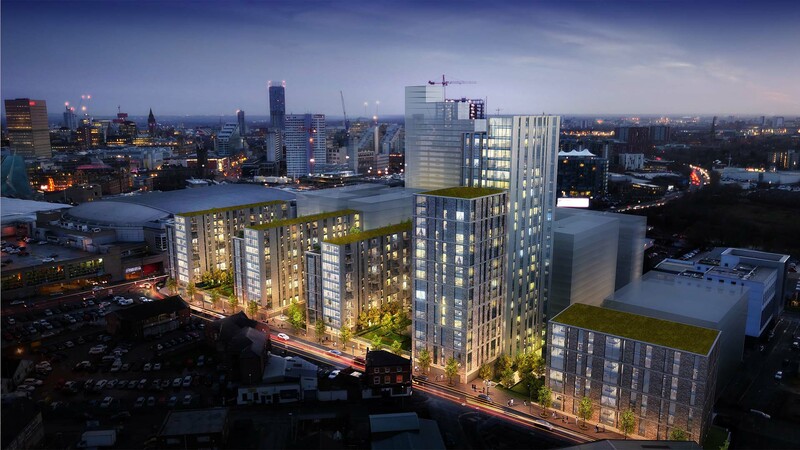 Our design is based around the creation of three physically distinct learning zones, responding to the school’s vision of providing double height learning plazas to facilitate a wider range of learning activities. Classrooms and circulation routes have been arranged around these zones, creating an open solution to inter department circulation. 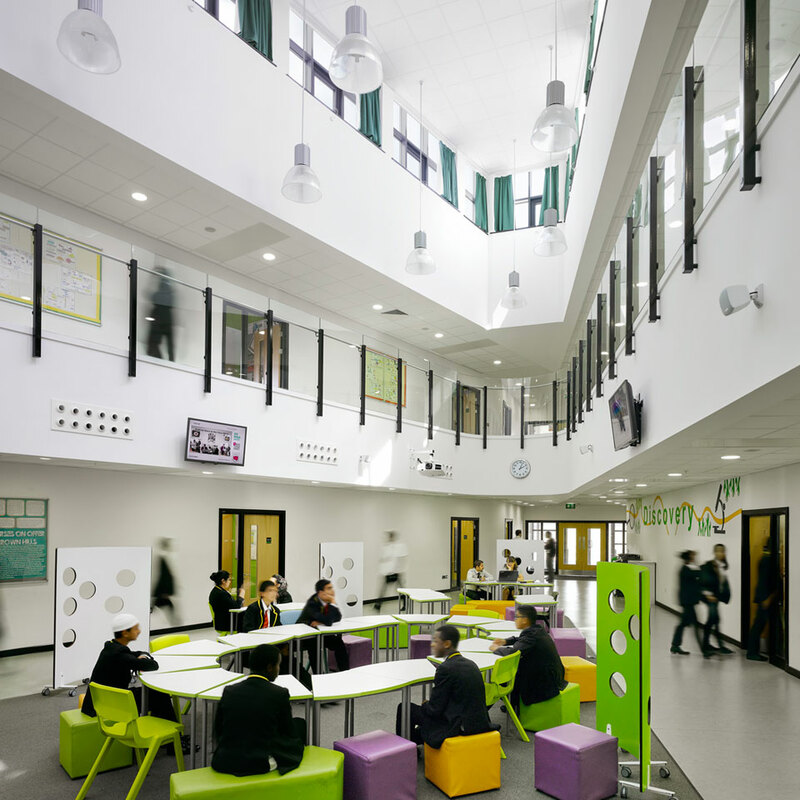 An integrated service hub has been designed into the reception area at the front of the school which allows for a range of multi-user groups to be located within the school. 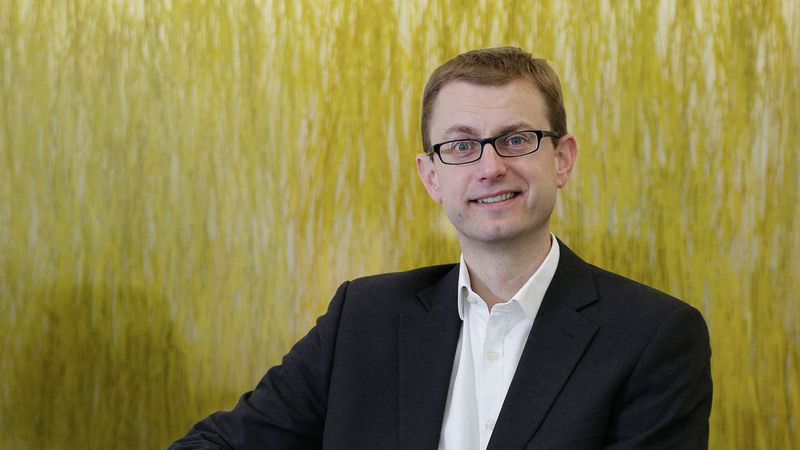 The school's specialism is sport with a particular emphasis on cricket. 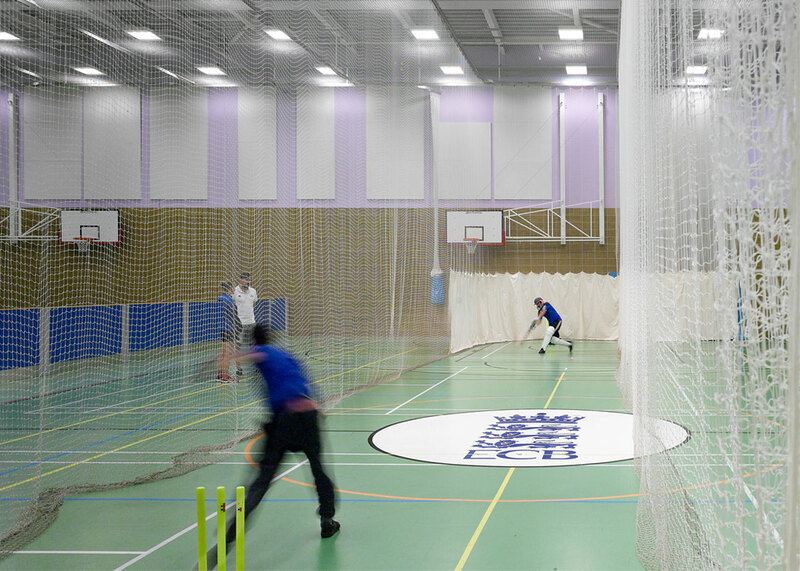 The scheme features an eight court sports hall designed to deliver indoor cricket training. Partly funded by the English Cricket Board, who will have shared use of the facility outside of school hours. The sports hall and pitches are showcased and located at the heart of the building, with the fitness studio situated forward of the main building line with a glazed frontage offering discrete views in and out. Materials for the school’s façade were chosen to help integrate the building into its nearby surrounding. The use of local brick with intermittent curtain walling provides a source of natural light into the school, whilst the contrast between the solid nature of the brickwork and the glazing helps signify the entry points into the building. The geometry of the STEM and social arts learning zones results in the formation of an apex pointing out towards the playing fields. Architecturally this has been treated as balcony areas, providing excellent external teaching opportunities and views across the playing fields, showcasing the sporting activities taking place around the school. Student access to the main entrance to the school is via a newly landscaped pedestrian only plaza. 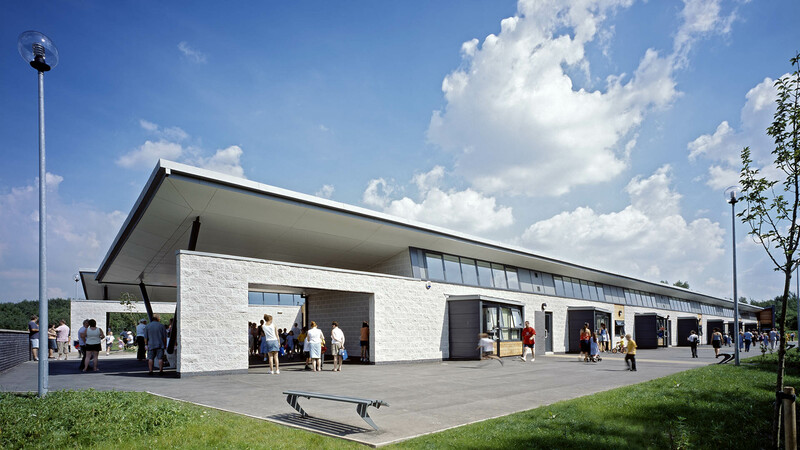 Paved pedestrian areas provide both stepped and graded access to the lower hard play area from the external dining and quieter social spaces. 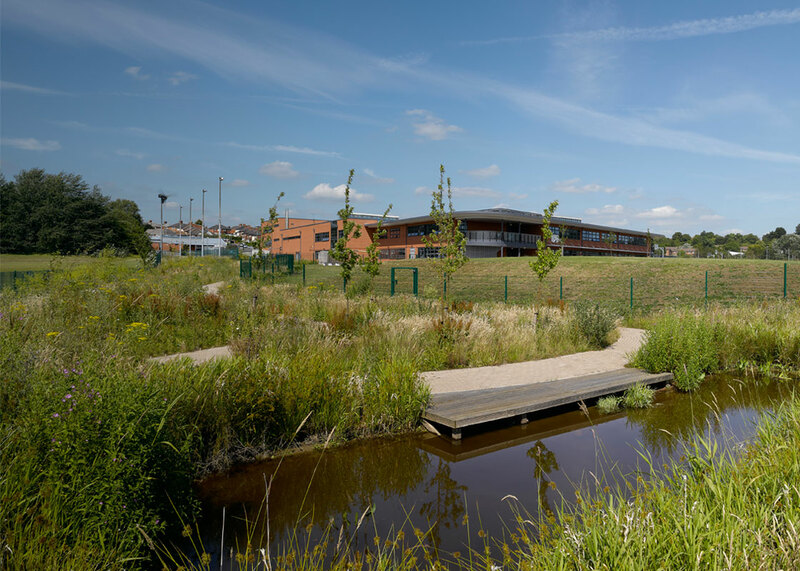 A habitat area, science garden and a horticultural area is located to the west of the school, providing a variety of teaching spaces and landscape resources to support the curriculum.